as most of you might know by now, the artsy ants won't be an ocean apart for the next few weeks, as simona and her husband are here in germany with us all. on monday, while the baby was napping and the little man was happily bouncing off his aunty's back (hee hee), i sat in the garden and actually continued knitting. so much that i got motivated to carry on at home in the evening. so as you can see i did end up using blue yarn for the collar of the plain vest, and i like how it contrasts the orange. i managed to squeeze 3 books into the photo: i finished Me Before You last week. it was a lovely read, with wonderful, lovable characters. i had anticipated the ending of the story, but i can still recommend it. the story and the characters stayed with me for a long time and i found myself thinking about them in the days after finishing the book. i even started making research about quadriplegia. i then started Last Child in the Woods , which is good, but i need a fiction read as well, so i also started Anne of Green Gables. i think i never read Anne as a young girl, at least i don't remember. but i want to read books that i hope my junebug will enjoy one day, and this was one on my list. joining ginny again this week. what are you knitting and reading?? lovely knitting and have fun with that sister of yours! I hope you remember to pick up the camera once in a while to share with us. It is so wonderful to know that you two are together. I agree with you Sylvia, Me Before You does stay with you. I have been doing a little research myself. We have a young friend who is now in a wheelchair because of a car accident, it's tough. I hope ya'll have a great time! Oh those two colours are lovely together. I read Anne of Green Gables as a girl, need to pick it up again :) Enjoy! we've got family together this week, too.....isn't it the best?????? 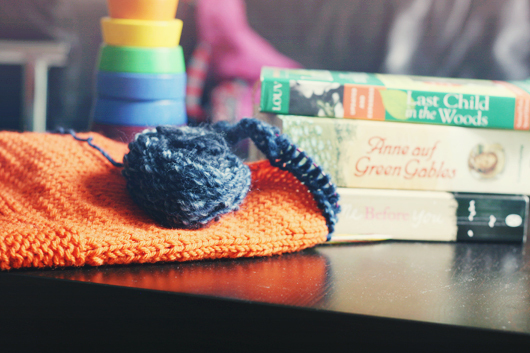 love the knitting time you've squeezed in....and the classic reads. sounds like your week has been pretty perfect! Orange is one of those colors I seldom think to use (and am in fact a bit afraid of), but when I see how other people use it I am full of admiration. I love the little vest and how the blue complements it! The plain vest is a versatile favorite of mine. Love the added bold at the collar! Holy Horse! I just finished that book and I know exactly what you mean. Just thinking about the book makes me want to break down and cry. Even though it goes against my religion (Catholic), I understand why Will made the choice that he did. It all comes down to one's quality of life. I love the orange and blue together. I must read Me Before You, so many people are recommending it! sounds like an interesting book! love the colour combo!